There has been much talk recently of fake tennis racquets from China flooding the international markets. Even in the US market where counterfeit and piracy is almost non existent we find cases of fake counterfeit tennis racquets being sold on eBay! I recently wrote an article about a fake Babolat Pure Drive that I have managed to acquire from a friend. The issue about fake tennis racquets are not only about how authentic they look up to the hologram labels that are issued with them, but more of the problems found with the cheap low grade composite materials they are made with resulting in poor weight distribution and balance. This might also potentially get you injured as well as compromise your level of play. It is therefore recommended that you get an authorized tennis racquet from the original manufacturer to get consistent playing results and quality proprietary composite materials and patented technology such as Babolat's Aero, Woofer and Cortex systems, Head's Liquid Metal, Flexpoint and most recently MicroGel technology and Wilson's Ncode nanotechnology and K Factor kerophite black technology to bring out the best in your game. While all this may be considered just marketing hype, the important thing for any player as well as manufacturer is to get consistent results and that is where getting an official tennis racquet or product from the original manufacturer is important. Up till today, I had strongly advocated this belief, but what I discovered to my horror will make me think twice about this! While I am still for purchasing an official licensed product from the original racquet manufacturers I strongly suggest being careful about the quality. Let's face it, most of the major tennis racquet brands and models are made in China. In the past, Chinese products have been known for being shoddy and have very poor standards of quality control. But in recent years, China has become a major supplier in the consumer markets for just about anything and everything including tennis racquets under license for the major international tennis companies. Their manufacturing standards and quality control are now second to none and they have now been able to compete on the world stage where mass production and manufacturing are concerned. I remembered reading about Wilson's famed St Vincent process and why touring pros like Pete Sampras exclusively swears by his Wilson Pro Staff racquets that have been made in St Vincent due to the stringent quality control standards. It can now be no longer assumed that if you purchased a genuine official product from the manufacturer, you will get consistent quality. My test results below had confirmed this and the findings had astounded me! After selling away the Wilson K Six One 95 team, (review of the Wilson K Six One Team here) I decided something with a little more heft. The most likely candidate naturally would be the Wilson K Six One 95. Which is a wonderful racquet to play with. My review of the K Six One 95 found here. I was so impressed with this stick that I decided to purchase my second one last week. I felt a slight variation in grip size at the tennis store but I attributed that due to the plastic wrap as well as the brand new white original grip that came with the racquet. I didn't think much of this until I started using the racquet. It felt slightly different and I was struggling with the grip size which now felt bigger and I couldn’t really grip the racquet well. I thought maybe it was the problem with the new replacement grip so I decided to replace with something thinner. I tried it out the second time round but the Wilson K Six One 95 still felt a little different. I then compared it with my original K Six One 95 and to my amazement, the grip size varied somewhat. I still though it was due to the replacement being still new. I decided to remove both over grips from both my K Factor K Six One 95 and too my astonishment when I compared both 4 1/4 grip sizes side by side without anything on but the just the solid wooden shafts they felt different! 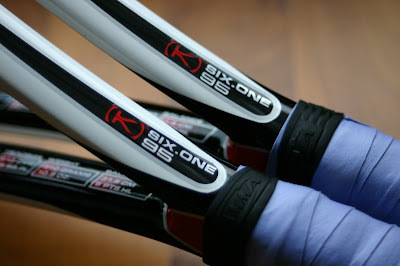 The racquet grip size of my first K Factor K Six One 95 felt noticeably smaller than my newer K Six One 95. I was dumbfounded and shocked that this could happen. I then spoke to several of my friends to seek their opinion. I showed them the differences and they agreed with me that they felt that the grip sizes differed considerably when comparing both racquets. I then concluded that if the racquet grip sizes differed, there might be also a possibility of a shift in weight distribution to weight of the racquet as well. I decided to do a racquet balance test. I was right! Not only was there a variation in the grip size, even the racquet weight distribution varied considerably! I only heard about this issue with fake or counterfeit tennis racquets, never with a genuine product so this was a first for me. Racquet balance issues with my genuine Wilson K Six One 95 (Asian Model). I have balanced both Wilson K Six One 95 racquets at the throat with a pencil. You can clearly see from the image that both racquet shows inconsistent weight balance. The one which is further to the back is clearly more head light and was my first racquet which I purchased. The racquet which is closer facing is the second K Six One 95 that shows a more evenly balanced frame. Take note, that I have also removed the original replacement grips and have used the same set of strings to ensure that both racquets are consistent in weight balance. Images of the K Six One 95 wooden racquet shaft. The difference in weight balance is clearly evident from the images above. The results I am getting seem to suggest differences in the racquet. I am unsure if this could have been an isolated one off incident or a problem with the manufacturing batches. Since I got both identical racquets about a month apart. 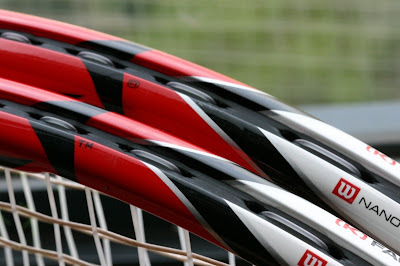 It could be just a variation in the racquet manufacturing batches but still Wilson should be more rigid in its quality control and manufacturing consistencies. I sent an email to Royal Sporting House and Wilson with my complaint. To date, Wilson has not responded but Royal Sporting House had offered to replace my racquet at no cost. Royal Sporting House is the sole distributor for Wilson and Babolat tennis racquets and products here in Singapore. I went to one of the Royal Sporting House outlets here in Singapore to get my Wilson K Six One 95 replaced. I was happy with the service provided by the staff at Royal Sporting House and their willingness to help out. The staff there gave me around nine K Six One 95 racquets (4 1/4 SL2 grip size) to choose from. All of them but one had a grip size which felt larger than my first K Six One 95 racquet. So I decided to take the one which was similar in grip size as my first racquet. The K Six One 95 has generally poor paint work and it doesn't have the high quality finishes like those of Yonex tennis racquets. My Yonex RDS 001 shows supreme and identical finishing in every aspect and its paintwork was superb. For the Wilson K Six One 95 it had a poor finish especially at the black and white edges you can see the paint actually running off the lines and slight smudges. That is perhaps the difference between a made in China racquet compared to one that is manufactured in Japan. 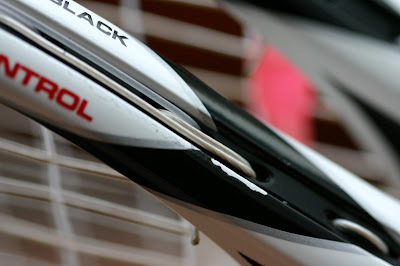 If you however compare the finishes of other made in China under license racquets such as Babolat, Prince and Head the finishing as well as the quality control is fairly consistent. Scratches found on the side of the frame not due to any mishandling but more of the paintwork peeling off itself. The K Six One 95 racquet that I picked out already had scratches on the paintwork and this was not through rough handling but more of it peeling out itself. There were also paint bubbles in the paint work, and trying to rub it off will result in the paint peeling off. I had no choice but to take this racquet as that was the only one which fit my grip size. Well at least one of my problems with this racquet had been resolved. Unfortunately my new replacement Wilson K Factor K Six One 95 was more even balanced than head light resulting in the racquet having a different feel and swing weight. 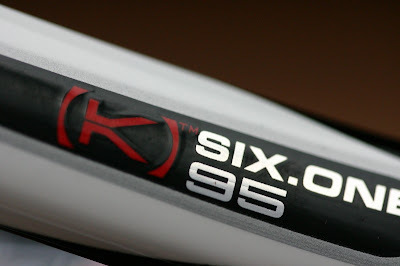 I could feel the difference in power when I was hitting with the replacement K Six One 95. It had noticeably lesser power than my first racquet. While going through the racquets to find a suitable replacement, I also noticed that most of the racquets had different balance compared to my first K Six One 95. Different positions for the Registered ® logo found on the top left hand corner of the Wilson K Six One 95. Again, I am not sure if this is a manufacturing problem or since the racquets came from differing manufacturing sources and factories some of the manufacturing standards differ. I did however notice that the serial numbers were different suggesting both racquets were from a different manufacturing batch, that is assuming that the hologram labels and serial numbers were placed during the exact time of manufacture or not until much later after the K Six One 95's were all sorted together and sent to the various distribution channels to be then shipped overseas. Different positions for the Registered ® logo found on the top right hand corner of the Wilson K Six One 95. The hologram labels were only attached later on so tracking the date of manufacture, place of manufacture and times might be virtually impossible. Some slight differences printed on the racquet suggesting that both my K Six One 95 could have came from different factories or manufacturing batches. I also noticed some slight differences on my new Wilson K Factor K Six One 95 racquet. Besides the differences in weight balance, I found more evidence that backs my theory that the Wilson K Six One 95 is manufactured in different batches and perhaps in different factory locations. Certain printed areas of the Wilson K Six One 95 contained Registered ® as well the Trade Mark ™ logo at differing locations. I have highlighted the differences found in the two versions of my Wilson K Six One 95 in the images found below. My advice is that you will need to do some quality checks on your own before you buy any racquet. Take into consideration the weight balance and grip size. Be patient and if possible try to run through the entire batch at the store to find a model that is most consistent in weight balance and grip size. 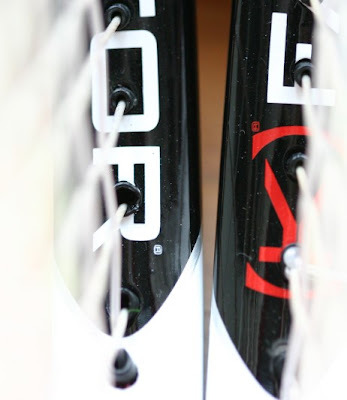 The other K Six One 95 Contains the Registered ® on the throat of the racquet. Once you've selected a racquet that you're happy with, do a racquet balance test with the other similar racquets that you've gone through to see if the balance is identical. Use 2 to 3 racquets as a guide. If you have the intension to buy your second racquet, it’s highly advisable to bring your first racquet to make comparisons. There might be slight variations in the balance and weight distribution of the racquet. I am not sure if this might be an issue with just my racquet or with certain batches of racquets but as a matter of being cautious, I would highly recommend that you to do some comparisons test before you make a purchase. Registered ® as well the Trade Mark ™ on the sides of the racquet suggesting that these two Wilson K Six One 95 racquets came from two different manufacturing sources or locations. In terms of playability, the Wilson K Factor K Six One 95 is an excellent racquet to play with. 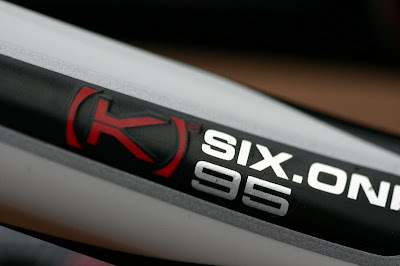 My review of the Wilson K Factor K Six One 95 can be found here. Overall I have no issues with the performance of this racquet, except for the experiences that I've encountered here. More images of the Wilson K Six One 95 here. Roger Federer Using a Flexpoint? Buy your Hard-To-Get Tennis tickets today! RazorGator is your source for US Open tennis tickets and Wimbledon tickets. Go to Vividseats.com for all your Tennis Tickets needs! We buy and sell at great prices all Masters Cup Tennis Tickets , Rogers Cup Womens Tennis Tickets , Davis Cup Tennis Tickets , US Open Tennis Tickets , Wimbledon Tickets , and Wimbledon Packages Tickets. Copyright 2005-2009 Regentville Tennis Singapore.